In his lecture on 21 October , 2010 at the opening of the NDC seminar on “The Role of Force in Strategic Affairs” to celebrate its golden jubilee, National Security Adviser Shiv Shankar Menon had referred to India’s ever popular epics, the Mahabharata and, the Gita and the Arthashastra by Chanakya, which deals with both internal and external uses of force. I reproduce extracts from my paper “The Profession of Diplomacy - A Brief Outline of Indian Experience" presented in April, 1988 at a seminar held in Nairobi, Kenya on “Training of Third World Diplomats” attended by Heads of Diplomatic Training Academies/Institutes from all over the world including Vienna, when I was establishing Foreign Service Institute for India’s Ministry of External affairs (1987-89) in New Delhi. "My nationalism is intense Internationalism. I am sick of strife between nations and religions." - Mahatma Gandhi. Vedas, Smritis, Upanishads, Puranas and commentaries by scholars on Hindu jurisprudence constitute principal sources of ancient Indian thought on State, society, law and philosophy. There might be some dispute about how old these ancient writings are, but Vedas evolved out of the intuitive thoughts of ancient rishis (wise seers), certainly much before 2000 years B.C., Smritis and Upanishads before Buddha, about whose birth and teachings in 6th century B.C., there is no dispute. Smritis are divided into Sutras and Dharma Shastras. Dharma Shastra, also known as Manu Smriti enjoys unquestionable precedence in Indian philosophical and legal thought, inter-state relations and diplomacy. Commenting on different roles of authorities in a State, Manu stated, "Let the king appoint an Ambassador; the army depends on its Commander; control of subjects (depends) on the army; the Government of the kingdom on the King; peace and war on the Ambassador". Vedic literature and Smritis have treated the State as an individual sovereign unit and also as a component unit of a circle of States called Raj Mandala, to control and regulate relations among them. The protection and promotion of political, military and economic interests of a State rested on five constituent elements; the Ministers, the kingdom, the fortress, the treasury and the army. Manu had advanced concepts like befriending the enemy of a hostile neighbor, neutrality, mediation etc. now universally accepted. Commenting on the importance of Ambassadors, Manu states, "The King has to be careful about the details given by the Ambassador, the whole range of inter-state relations and the existence of the State depends on the efficacy of the Ambassadors." According to him, a high degree of intellectual equipment was necessary for an Ambassador; and in selecting people for diplomatic missions, one must choose persons who are "loyal, honest, skillful, possessing good memory, fearless and eloquent". Writings of these and later times emphasized these qualities and added that an envoy must be sweet voiced, persuasive, industrious, well-versed in sciences and possessed of faculty of reading others' thoughts and feelings from their behavior and appearance etc. In Ramayana, before the declaration of war between the forces of Rama, the Aryan King and Ravana, the Demon King, Hanuman was sent as a diplomatic messenger to persuade Ravana to return Rama's wife Sita whom Ravana had abducted. The mission failed, but when Ravana sentenced Hanuman to death and ordered his execution, Ravana's younger brother Vibhishana pleaded that the order be revoked, since according to the law in force, it was not permissible to kill envoys and messengers. The sentence of death was reduced to a lesser punishment. Before the final declaration of war between Rama and Ravana, another effort was made through Angada who was sent as a diplomatic messenger. In Mahabharata also, Lord Krishna was sent on a diplomatic mission on behalf of Pandavas to the Court of Duryodhana to avoid the wholesale war between the two princely families. When an attempt was made by Duryodhana's supporters to assault envoy Krishna, it was emphatically and successfully argued that the person of the Duta (diplomatic messenger) was inviolable and therefore could not be assaulted or punished. A diplomat had to be treated with high dignity and respect. After the period covering the Vedic and epic literature, a variety of principles on International relations, diplomatic practices and methods, means of reconciliation and arbitration, principles of war were developed and perfected. An interesting concept was the Chakravarti Raja (Universal Monarch) whose suzerainty or protection, after wars, if necessary, was acknowledged by surrounding kings. It is quite akin to the modern-day super-power rivalry, with their pacts, doctrines and areas of influence. The knowledge and art of diplomacy like other knowledge and wisdom, which was considered sacred was imparted through the institution of an Ashram (a hostelry where the teacher and his disciples stayed together) and other institutions. The technique of imparting Vidya (knowledge) through the institution of guru-sishya parampara (teacher-student tradition) continues in India even now, in the field of music, dancing, painting and other areas. A significant document, recovered in the early years of this century (20th), is the Arthashastra (an exhaustive treatise and manual on statecraft and diplomacy). It is a prose work in 15 books authored by Kautilya, also known as Chanakya and Vishnu Gupta, who was the principal counselor - adviser of Emperor Chandra Gupta Maurya and was composed around 300 B.C. It shows close acquaintance with the administrative and the diplomatic methods of Hellenistic States, particularly in Syria and Egypt and is a distilled quintessence of various schools on this subject which then existed in India. The institution of diplomatic envoys is dealt in Book-I, Chapter XVI. Whether the diplomatic mission is ad hoc or permanent, the mission had to follow well accepted principles in inter-state relations. Adoption of appropriate 'diplomatic language' was considered important in dealings between rulers and kings. Guda lekha (code language) was adopted for diplomatic correspondence. The classification of Ambassadors, his qualifications, status, immunity, duties, salary etc. are discussed in great details. A successful Adviser (Minister) was deemed suitable for the post of Ambassador, a practice followed by many nations now for important Missions. Of course, there was no paraphernalia like Minister/Counselor, First Secretary etc. and the Missions may not have been of permanent duration in all States. (d) Sasanarhah (Diplomatic Messenger / Special Envoy). The grading of rank and status varied with the degree of responsibility entrusted in the diplomatic agent (as in modern times). Kautilya also deals with the methods and principles that are to be adopted by a diplomatic agent in fulfilling his mission. He categorizes the missions as madhyama (mediatory), udasina (neutral), vijigishu (conquering the king) and ari (enemy). He also gives detailed instructions on the institution of intelligence network and the role of spies, which was necessary for the maintenance of internal security and for efficient and successful conduct of foreign relations. The intelligence reports and those from envoys were double checked and analyzed. There were women spies in the garb of wives, courtesans and even prostitutes, ascetics etc. Techniques for finding out the weakness of enemies and ways to exploit it (blackmail) were well delineated. Other measures included collection of information, dis-information, and if necessary use of force to eliminate enemies. The concept of Raj Mandala i.e. Inter-state relations was further elaborated and detailed strategies explained. The concept of treaty was widely practiced in inter-state relations. "One shall make an alliance with a king who is stronger than one's neighboring enemy; in the absence of such a king, one should ingratiate oneself with one's neighboring enemy, either by supplying money or army or by ceding a part of one's territory and keeping oneself aloof; for there can be no greater evil to kings than alliance with a king of considerable power, unless one is actually attacked by one's enemy." "When the advantages derivable from peace and war are of equal character, one should prefer peace; for disadvantages such as loss of power and wealth, sojourning and sin are ever attending upon war." "A king, who is situated between two powerful kings, shall seek protection from the stronger of the two or one of them on whom he can rely; or he may make peace with both of them on equal terms." For the purpose of settlement of disputes, four methods were advocated, namely, 'sama', 'dana', 'bheda', and 'danda'. Sama (conciliatory approach) should be the first step in tackling a dispute or problem, followed by appeasement (dana); when it failed then effort to create division and drive a wedge between the opponents (bheda) was prescribed. The use of force (danda) was to be employed as the last resort when all other methods had failed. 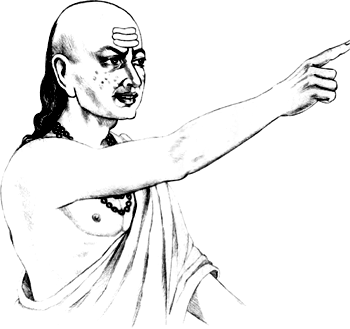 According to Arthashastra, the State should follow a six-fold policy with other States: (1) Sandhi (treaty of peace); (2) Vigrah (war); (3) Asana (neutrality) (4) Yana (marching) - presumably a threat; (5) Samsrya (alliance) and (6) Dwidibhava (making peace with one and end war with another). The wealth of contribution by Kautilya to the science of diplomacy, statecraft, administration, management is stupendous and invaluable and deserves a greater attention and study in our days. It is clear that in ancient India, the concepts of statecraft and diplomacy was an organized discipline for advancing a nation's interests through peaceful means. During the Buddhist period and later, many rulers entrusted delicate and strategic missions to diplomatic agents for the security of the State and for the maintenance of friendly relations. During the reign of Indian King Bindusara, Delmachos was sent as an Ambassador by King Antiochos of Syria and Dinyosius as an Ambassador by King Ptolmy of Egypt (298 BC - 273 BC). Emperor Ashoka (273 BC - 232 BC) established diplomatic relations with the Kings of Ceylon (Sri Lanka), Syria, Egypt, Macedon, Cyrene and other countries. During the 7th century AD, there were diplomatic relations between the Indian King Pulkesin II and Shah of Persia, Khosru Parwez. There is evidence of diplomatic relations between King Harasha Vardhana of India and the Imperial Court of China. During the medieval period of Indian history, as in earlier times, diplomatic relations were maintained among States in the Indian sub-continent, as well as with States beyond it. The Afghan and Turks rulers based in Delhi and other places, maintained diplomatic relations with States in Central Asia, Persia, Arab world, Asia minor, Greece, Levant and even with States in Tibet and China. The Kingdoms of South of India on the West Coast, maintained diplomatic relations with States along Arabian Sea Littoral and Indian Ocean littoral in Africa. The ones on the East-Coast and South, maintained relations with Ceylon, Burma, Thailand, Indonesia, Malaya; some of these countries were conquered and colonized by the Kings of South India. The Moghuls maintained diplomatic relations with most of the states mentioned earlier and in the later stages received envoys from European states like Portugal, France , Britain, Holland, etc. During the period of struggle for the Indian Empire between the Titular Moghul Emperors and other Indian States on one hand and the British, Portuguese, French and other naval based European powers on the other hand, the Indian kings, like Hyder Ali, Tlpu Sultan and others maintained diplomatic relations with countries in the Arab world, Ottoman Sultans and European powers in order to obtain support in political and financial areas and others like defense technology and training expertise and techniques. During the British rule over India and in the region, the conduct of international relations became a responsibility of the British Crown and policies were formulated In London. It may, however, be reiterated that, like the Moghuls earlier, the British had also modified the existing system of administration, following from the days of the Mauryan Empire. In regard to collection of revenue, maintaining law and order and administering justice etc. they only superimposed the British system over it. Even the system of administering a district was based on the Moghul Sarkar system, which was headed by a Faujdar - a military officer, representing the provincial governor. After experimentation, the district head was designated a Collector, who was given the powers of the Faujdar for maintaining peace and order and of Amalguzar for collecting revenue and looking after the peasants. The system became and continues to be the lynch-pin of administration In India. The police system modified and expanded from the old Moghul Daroga system, finally blossomed as it exists now after the Police Act of 1861. The earlier senior district and police officers were British. In late l9th century, top revenue and judicial administration was devised, based on Macaulay Committee Report, and run by Officers recruited through competitive examinations - many years ahead of England, where entry to Civil Services was by patronage. The Indianisation of Civil Services seriously started only after 1917, when the number of Indian entrants through competition was increased to 50%. The middle and low level officers in all departments were recruited partly through examinations, but mostly through patronage. From this cadre of trained Indian Civil Servants, some of whom were also seconded to the Political and External departments of the Government of India, emerged the nucleus of bureaucrats who formed the Diplomatic Service, known as the Indian Foreign Service (IFS) after Independence in 1947. The gap after the departure of the British Civil Servants and the extra requirements to meet the sudden expansion of India's representation abroad was filled by special recruitment from retired Defense Services Officers, Scions of princely and ruling native States, those who had studied abroad, etc. We have gone through your article on Diplomatic Profession in Ancient India, which is very much interesting. We feel that a complete book on the topic, if made available, will be useful to the contemporary reader working in this filed. We take this opportunity to introduce ourselves as one of the growing publisher in the field of Indology under the name of Kaveri Books based in publisher's market at Darya Ganj, New Delhi. If you can elaborate this topic and convert it into a book, we will be interested in publishing the same. Why, the Lord Krishna failed to maitain nurality and took one-side.